"Claude Rains once again plays an invisible being. But he's at least 78% more whimsical here. His hair is just this side of 'twee'." Doesn't it seem like there's been a spate of remakes lately? Have you ever heard the old maxim that the same 20 scripts are constantly circulating around Hollywood and are the basis for every movie made? Usually it can be heard coming out of the mouths of aspiring but weary screenwriters or those outside-the-mainstream artiste types. Normally I'd just chalk it up to sour grapes, but a movie like "Here Comes Mr. Jordan" certainly gives it some credence. 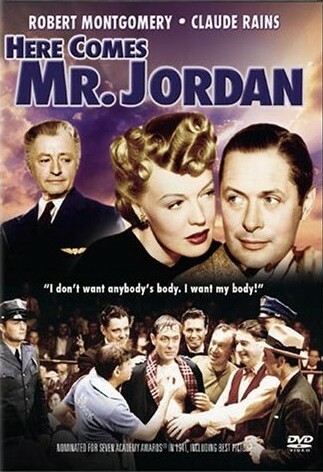 The script for "Here Comes Mr. Jordan" was adapted from the play "Heaven Can Wait" written by Harry Segall. The movie has since been remade twice, once in 1978 with some degree of success under the original title "Heaven Can Wait" starring Warren Beatty, James Mason, and Jack Warden. The more recent version entitled "Down To Earth" was made in 2001, starring Chris Rock and Chazz Palminteri was somewhat less effective. But this 1941 version is a beloved classic, and in my humble opinion, deservedly so. The basic plot revolves around an aspiring heavyweight fighter and amateur pilot named Joe Pendleton (Montgomery). He's training for a shot at the title when he decides to make a quick trip to the city in his puddle-jumper. But his title aspirations are cut short when his plane crashes and poor Joe finds himself in what has to be the most bureaucratic vision of the afterlife ever conceived (until Defending Your Life comes out some 50 years later). In the fluffy yet stuffy ever-after Joe meets his case worker, a snooty little jerk named Messenger 7013 (Edward Everett Horton) who tries to give Joe the bum's rush into heaven. But Joe wants to see the manager, and so we meet the eponymous (and much friendlier) Mr. Jordan (Rains). After looking into the matter briefly, it turns out that Joe's spirit was taken from the wreck of his plane prematurely (stupid Messenger 7013! ), and now he's owed a new body to continue his life. But this not being a Romero flick, they can't just throw his spirit back into is freshly buried body, so they've gotta find someone relatively young and healthy on Earth who's just about to croak, so Joe can jump in and take over. Joe is of course reticent to start anew in a new skin suit, and so begins a number of bizarre situations both in the material plane and in the spirit realm, all aimed towards (literally) getting his life back. Needless to say it involves all that's interesting in life: murder, love, boxing, and more Brylcreem than you can shake a stick at. Montgomery as Pendleton is spot on. He's equally bewildered, outraged, and resigned to the bizarreness of his afterlife plight, and he wins us over with his jocularity right from the start. Even his more annoying personal habits (such as the repeated use of the phrase, "I was in the pink! ", in regards to his pre-death physical state) are defused in a humorous and light manner, usually by the unflappable Mr. Jordan (who replies, "That is becoming a most obnoxious color, Joe"). Rains' performance borders on the creepily omniscient side, but he pulls it off well enough to make us like him in the end. He really has Joe's best interest at heart. Unfortunately the supporting cast is a mixed bag. James Gleason as Joe's former trainer Max fairs best. He's properly terrified (but in a funny way) of some stranger claiming to be his former (and now dead) charge. But the women in Joe's life are less enjoyable. The de facto love interest, Bette Logan (played by Evelyn Keyes) is very one note, as is the evil Julia Farnsworth (Rita Johnson) who, through a bizarre set of circumstances, becomes Joe's scheming wife. With such an unusual concept for the protagonist to be dealing with, they solved the problem of Joe changing in and out of bodies in a rather pragmatic way. Robert Montgomery plays all the editions of "Joe", no matter the body. There's no "THAT'S what I look like?!" moments that are used so often in "soul-switching" movies. Joe's so focused on getting his life back that the details of what he looks like and who's body he's "taking over" are often of secondary importance. I think that's where the remakes and other movies of the old "soul-switcheroo" ilk miss out. They put too much stock in the comedic value of "Chris Rock's in the body of an old, rich white dude" or "Kirk Cameron & Dudley Moore are trading places!" They miss out on the opportunity to show everyone else's confusion. Joe Louis, who was champ at the time of this movie, makes it all the more stark by comparison. Wisely, they don't show any "real" fight footage, and Joe's big fight finale is played out off camera, over the radio. I love when I come across an old gem like this. Sure, the acting can be a bit stage-y at times, but for a movie from this time period, it's actually quite timeless. Even being able to see the ending coming from a mile away doesn't ruin the sweetness of it all. That being said, I was also impressed by the relatively black humor of the first 2 acts. They didn't sugarcoat the topic of death and murder and they still managed to keep it a "comedy", rather than a "KOMEDY!" The credit has to go Harry Segal's original stage play and the adaptation work of Sidney Buchman and Seton I. Miller (it earned them Oscars for 'Best Writing, Original Story' and 'Best Writing, Screenplay'), as well as some great performances by Montgomery, Gleason, and Rains (with Oscar noms going to the first two). If you happen to see this Best Picture nominee from 1941 coming up on cable, I definitely suggest giving it a look.